Not to be confused with Naval Piranha's Sewer. Naval Piranha's Castle is a stage located in Yoshi's Island and found in Super Mario World 2: Yoshi's Island and Yoshi's Island: Super Mario Advance 3. The stage is located in the depths of a sewer, which is really a maze, where various types of Piranha Plants appear. The boss of this stage is a common Piranha Plant on which Kamek casts a spell, turning it into Naval Piranha. If the player throw the egg at the bandaged navel three times, it will be defeated. Yoshi will start off in a sunset jungle area outside of the castle, with smiley hills, palm trees and bushes in the background. At the end of this small area is a Warp Pipe, where Yoshi can enter the castle, which takes place in the sewers. Inside the castle, Yoshi will have to cross a narrow corridor, with a Caged Ghost blocking the way. Since the ghost spits Shy Guys or Woozy Guys, Yoshi can eat them to lay eggs and throw them at the ghost, eventually opening the wall. Then, Yoshi will pass through flippers, leading to a small maze infested by Hootie the Blue Fish and small Ravens. This maze also has Red Coins, and corridors with water flows, pushing Yoshi to the direction of the water. There are also Piranha Plants in the water, sometimes being pushed by the water in Yoshi's direction. After this, Yoshi will get to an area, where he'll get advise on how to make eggs bounce off walls to reach out-of-reach items. A Message Block tells Yoshi on how to do so. 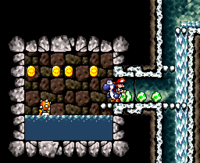 He can throw eggs in the walls, thus making them skip on the surface of the water, reaching the items. Yoshi will also have to reach a Flower by using this move. Progressing through the level, Yoshi will find more humid corridors, infested by Hootie the Blue Fish and Ravens, and some Wild Ptooie Piranhas. Nipper Plants can also be found here. Yoshi can find various Red Coins, and two Flowers in this maze. Some Aqua Lakitus can also be found here. Yoshi will also have to hit Caged Ghosts and Piranha Plants in his way with eggs. After passing through an area with Nipper Plants, a Wild Ptooie Piranha, and a Tulip, Yoshi will find the red door leading to the boss. French Égoûts de l'Ultra Piranha. Naval Piranha's Sewers. 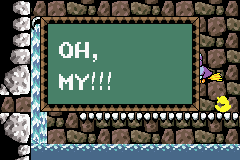 Kamek's reaction to Yoshi prematurely ending the boss battle. 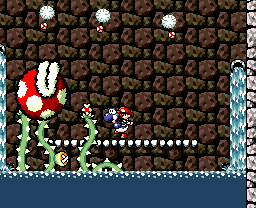 When Yoshi enters Naval Piranha's room, if he stands on the very edge of the platform that Naval Piranha's unmodified form rests on without triggering the cutscene that initiates the battle and fires an egg at it (or fires an egg at it from a similar area in the water), it will be instantly defeated before the boss battle even starts. Kamek will fly in and notice this, screaming "OH, MY!!!" before flying off. Yoshi will then clear the level as normal. This page was last edited on April 10, 2019, at 12:55.